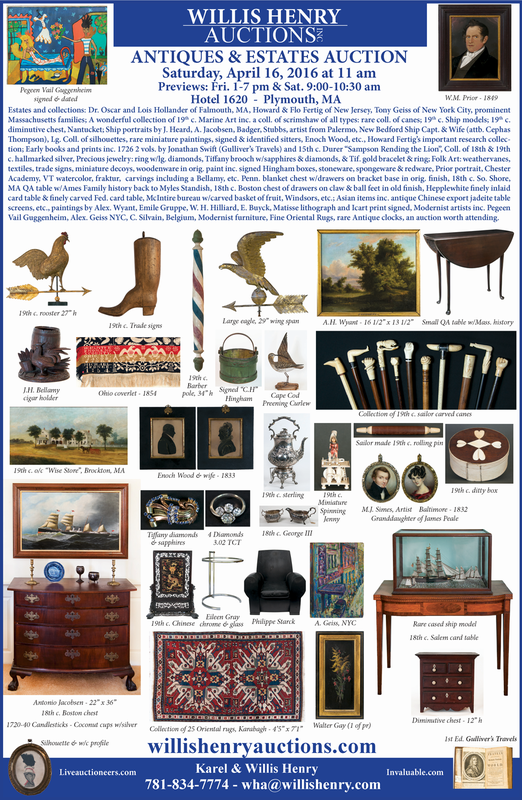 Antiques & Estates Auction - Apr. 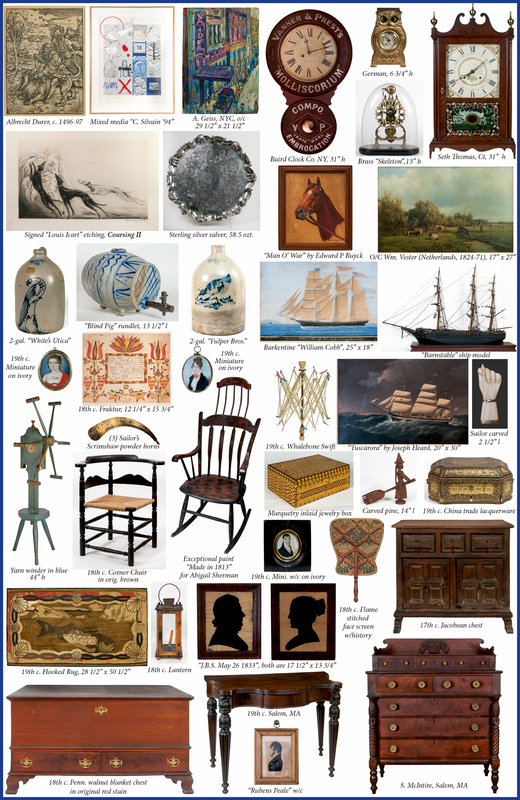 16, 2016 - Willis Henry Auctions, Inc.
Antiques drawn from many estates including the Fertig Collection of New Jersey, Tony Geiss of New York, Dr. Oscar Hollander of Falmouth, MA, prominent Massachusetts families from Norwell, Duxbury, New Bedford, and Cohasset, and others; exquisite 18th and 19th c. English and American Sterling silver pieces, exceptional collection of Nautical items such as important Scrimshaw, Ship Paintings, Ship Models and Prints. Oriental roomsize rugs and runners, collection of watercolor Miniature Portraits on ivory and paper, artist signed Silhouettes and the lifetime Howard Fertig research collection of rare books, notes and manuscripts concerning miniatures, silhouettes and folk art, large 19th eagle and rooster Weathervanes, important Paintings by Solon Badger, William Pierce Stubbs, Antonio Jacobsen, James Heard, Alexander Wyant, and William Henry Hilliard, collection of Modernist paintings by Alexander Geiss (New York/Russia, 1896-1974), important antiquarian Books and Prints to include a 1726 first edition two vol. set of “Travels Into Several Remote Nations Of The World” Jonathan Swift and a late 16th c. print of Albrecht Dürer’s “Samson Rending the Lion”, folk sculptures and artwork, fine 19th c. and 20th c. furniture including a diminutive Boston mahogany table from the Simeon Ames Family with lineage back to Miles Standish and John Alden, wonderful 20th c. preening shore bird on shell, whimsical clocks, fabric and German wooden dolls, miniature decoys, many fine pieces of stoneware, redware, spongeware and much more.